For a Christmas music connoisseur, Korea is hell. It makes up for some of it with amazing Christmas light displays that beat out New York City. The Korean Christmas cake is the other highlight. In fact, through investigations into what Korean families do on Christmas Day, it’s the only highlight. Christmas consists of opening a few gifts and eating a Christmas cake. No feasts. No carols. No big family gatherings. Santa is still an awkward thing, too. One of my friends was out with his Korean wife this week Santa shopping for their kids. He went to look for something and found his young daughter holding a present while sitting in the shopping cart. He looked at his wife. It’s a concept that has to still work out a few bugs. Since the Christmas cakes are the stars, and Koreans aren’t big home cake bakers, the multitude of chain bakeries, ice cream parlors, doughnut shops and anyone with an ice cream cooler or oven (except, surprisingly, the roti bun places) competes in the Christmas cake business. This is the busiest day of the year for the bakeries. They’re packed. All day long, each ajosshi you see on the street is carrying a cake box. 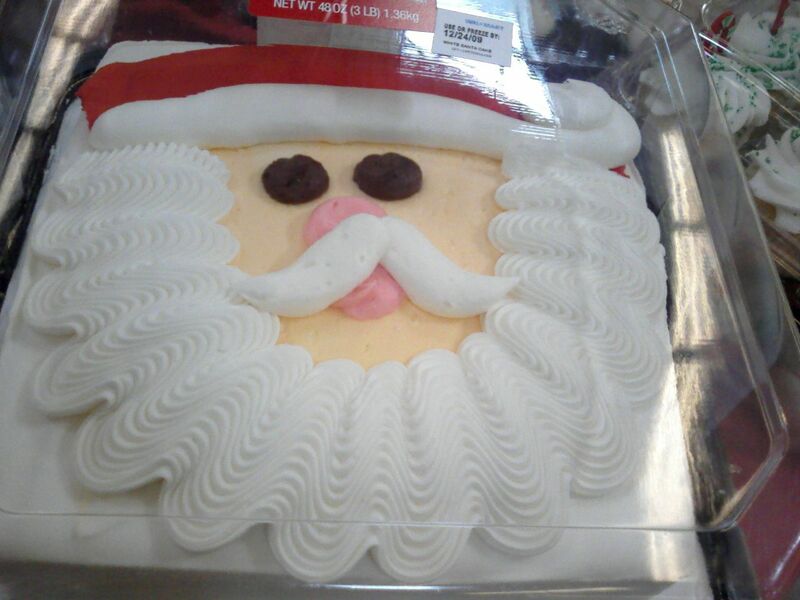 Christmas cakes don’t have any special Christmas flavors. No cinnamon and spices. They’re the same old cakes that they sell all year round. So in order to stand out, bakeries make the cakes as gawdy and over-the-top as possible. They’re impressive, considering the equivalent supermarket bakeries in America have these to offer. Let’s start with bakery chain Tous les Jours. Houses were a major theme this year. This one looks like it will get some drafts in the winter. Cute characters are always a hit. Check out this… I guess it’s a bear. And here’s a nice simple snowman scene. I’m a fan of these chocolate butter cream cakes. Santa’s at Frodo’s house. I think this is, in fact, the Rankin-Bass Santa. No, not quite. I’m more curious as to what the chimney is doing in front of the house. Oh, those hobbits! Here he is again on a strawberry cake. Either he’s delivering toys in a volcano, or something really nasty happened to the reindeer. Either way, that teddy bear don’t look to happy. This year, Paris Baguette embraced its faux Gallicness by pronouncing “Joyeux Noël” on its cakes. I’m guessing from the nose that this is Rudolph. He’s a bit swollen, I guess, from the mumps. Don’t squeeze those protrusions from his cheeks. Should get those looked at. I apologize for the shoddy photography, but this intrigued me by its double deckeredness. I know. It’s just a small cake on top of a large cake. But the architecture caught my eye. Watch out, Santa! There’s a pine-tree-shaped alien! It’s already eaten the inhabitants of that isolated cabin. I am sure these are cakes for those evil bratty girls who think they’re angels. The parents get it for her in a bout of wishful thinking. That look on her face… she’s hiding something. I’ve noticed more cookies have been incorporated in the cakes this year, and that’s a good thing. And here they are wheels for a train. It’s a train, right? If not aliens, we have the Big Bad Wolf sneaking up on Santa wearing a gouged sheep on his head. On a sleepy Christmas morning, this would pick me up. Snowman’s happy to see me. Nothing says winter like… um, blueberry cake. 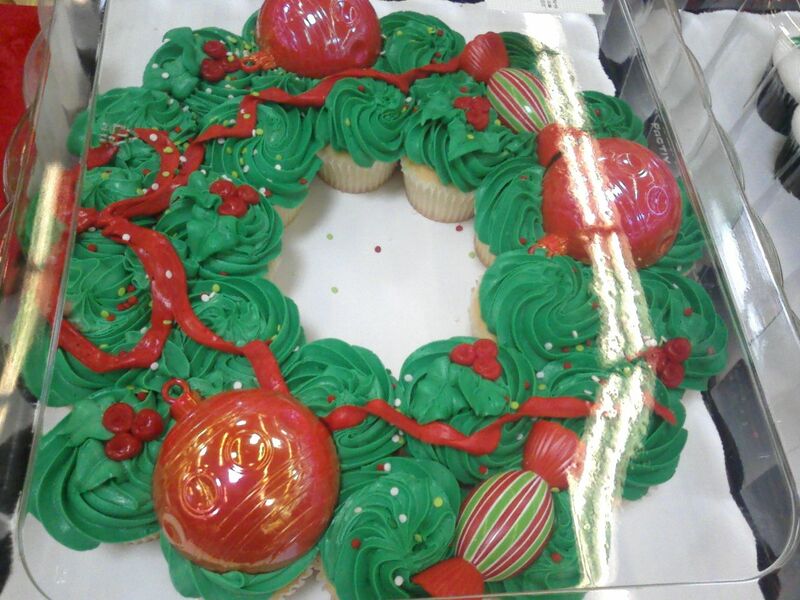 Dunkin is one of the most low rent of the chains with Christmas cakes. They didn’t even have any on display. I had to make do with this cardboard cut out. Baskin Robbins does its ice cream cakes. How else do they stay in business during this season? (I did see inside that they had a Boston Cream Pie flavor this month… may need to investigate further.) Now, I remember at home that Baskin Robbins cakes were combinations of cake and ice cream, since cake and ice cream go well together. In Korea, ice cream cakes have no actual cake. They’re ice cream molds. B-R likes to stack these ice cream chunks. Should someone warn Santa that the track is out? Oh, it’s a “Back to the Future 3” theme. Cute little chunky bear. Sorta reminds me of Madam Trash Heap. The selling of the cakes continues from December 23rd and 24th, and into the late night. Even midnight. Young ladies stand outside selling the last cakes, calling on customers to try free samples. This nice woman was more conservatively dressed than some of the cake hawkers I have seen on Christmas midnights. It’s a surreal experience. Women yelling about Christmas cakes. Middle aged men doing the last-minute rush for gifts and cakes. your commentary an these cakes – hilarious! my korean friends and i ‘celebrated’ christmas by going to karaoke wearing santa hats and singing carols. that’s one way to do up a korean xmas. Did all this stuff (dating on Christmas eve, Christmas cakes) just spontaneously generate in both Korea and Japan, or did it start off in one and then get copied by the other, or what? It’s a bit surreal. Please tell me they don’t eat KFC for Christmas dinner there. I was expecting the KFC thing in Korea, but they never promoted it. Turkeys are actually starting to catch on–expensive turkeys–billed as party foods. But it’s just the turkeys roasted by themselves with a few vegetables. No stuffing. No starchy or hearty sides. great humor Joe! Merry Christmas to you and Eun Jeong. o god. the kongrish is driving me up the wall. “happy holiday” in every single tab. love this post!! I love the cakes, but I did not know that they were the primary focus of the holiday here. Thank you for the information. I also think that your veiw on the cakes was pretty funny. Merry Christmas. Merry Christmas Cynthia, and all of you. It’s not the same as home here, but the Food Journal and Facebook have been giving me that warm fuzzy feeling all day. EJ and I have had a nice relaxing day. Had some leftover turkey meat from a party this week–stripped from a carcass I plan to turn into stock. Turned the meat into a comforting Turkey Pot Pie–with a side of kimchi, of course. Wonderful day! Folks, don’t be strangers here. How was your Christmas? by the way, we have a paris baguette here in LA and my mom bought a christmas cake for her pastor and they gave her that silly wolf/sheep hat. i wore this “wolf in sheep’s clothing” hat to a tweetup last nite and it was quite the hit! Thanks Leah! Come back any time.